Cozy Chicks: It's Rhubarb Time! Here in Wisconsin, spring is off to a slow start, so my rhubarb hasn't been ready to pick until now. 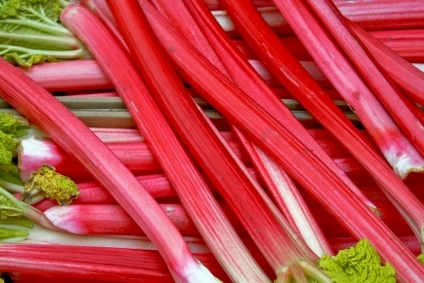 In the old days, grandma would hand me a stalk of rhubarb and a little bowl of sugar. What a treat, eating it raw! We always made an ice cream sauce, too. Which, BTW, is one of the recipes in Gertie Johnson's eCookbook, Cooking Can Be Murder, that just happens to be in the top 10 bestselling regional cookbooks on Kindle (the Gertie in me just had to brag). But as I get older right along with my overachieving rhubarb, I want to find a more healthful way to serve it. So I went online, found this recipe, and will try it tonight. I'm debating whether to serve it with chicken or with duck. Either way, I think it's going to be yummy. Combine all ingredients, simmer until rhubarb is soft, about 5 minutes. Remove the rhubarb and continue to simmer the rest until syrupy. Add the rhubarb. Serve. So tell me - do you like rhubarb? And what's your favorite way to eat it? I LOVE Rhubarb. I'm actually eating strawberry cheesecake with strawberry-rhubarb topping. We use to grow both strawberries and rhubarb so my grandma could make pies for us. As far as I know, I've never had it raw, but I might have to give that a try. My cousin makes a delicious apple and rhubarb pie. I can't wait to try more rhubarb recipes. Also, since my birthday is n July I always get a rhubarb dessert. Like you, I grew up eating my rhubarb raw. Now days, I make strawberry and rhubarb jam. Love it on my morning toast! Dare I admit it? I've never tried rhubarb. It's very pretty, though! Ria, give it a try raw! Fiona, that sounds yummy. And Sarita, maybe you should start with a rhubarb crisp drizzled with cream. Or a slice of rhubarb & strawberry pie. Save the raw experience for later. I have to say I am not a fan. My dad loves it. It must be a northern thing. My dad and his family are from Ohio and Indiana and I drew up with my grandma fixing it for my dad and his sisters all the time. I personal can live without it. My husband eats it raw with salt. I love strawberry-rhubarb pie but he won't try it. Ours is up and thriving. My mother-in-law makes a great rhubarb-strawberry jam that I like, and my hubby loves her rhubarb pie, tart, crisp, etc., pretty much anything else she makes with it! I think it is more of a northern thing mostly because it gets too hot down south for it to grow. Otherwise my grandma definitely would have grown and served it! I do like rhubarb - my favorite way to eat it is in a pie. The sauce recipe sounds good too. I only like it when my mother makes it. 1. In an ovenproof casserole, brown onions and meat in oil. Add turmeric and season, then pour in 2 ½ cups water, cover and cook over low heat for about 1 hour, stirring occasionally. 2. In a frying pan, fry parsley and mint in a little oil for about 10 mins. 3. Add parsley and mint, saffron water, tomato paste and lime juice to the meat. Cover and simmer for 55 min over low heat. 4. Add the rhubarb on top of the meat, cover and cook for another 10 mins or until the rhubarb is tender. We have had a horrible time getting some here- it's just been so rainy. When the stores do get it, there isn't much and it goes quickly. I have been working sat mornings so I haven't even been able to get to the farmer's market. Poor hubby is dying for some! Katy, thanks for the recipe! I can't wait to try it. Very different. YES I like rhubarb and I love it as pie YUMMY! !